Stephen Schwartz was born in Columbus, Ohio in 1948. More than half of his life was spent with a career journalist and author sebagaiStephen Schwartz. Stephen knew Islam and bersyahadah when served as a reporter in Bosnia. After embracing Islam, a former senior journalist San Francisco Chronicle is often criticized the Bush administration that is often equated with Islamic terrorists. Controversial articles appeared in a number of leading newspapers such as The New York Times, The Wall Street Journal, The Los Angeles Times, and The Toronto Globe and Mail. Stephen is also a regular contributor to The Weekly Standard, The New York Post and Reforma in Mexico City. Here's the story of a man who claimed to be interested in the lives of Sufi Islam in Bosnia and when the congregation actively participates in activities Naqshabandiah. Here's the news. Stephen Schwartz embraced Islam in Bosnia in 1997 or at the age of 49. Previously, more than 30 years, he conducted a study and draw from different life experiences and learn the history of several religions of the Book. How did he was impressed with the religion of Islam? "I'm interested in Islam since 1990 during a visit to Bosnia to conduct a study of Jewish history in the Balkans. I need the data to fill a regular column in the Jewish journal Forward. Well, in that study, I had time to establish contacts with the Balkan Muslim figures, "Stephen's story. If you view the history of his life, he claimed came from a "religious". "I was raised in an environment that is really extreme for most Americans. My father was a devout Jew. While my mother was the daughter of a prominent fundamentalist Protestant groups. He is very familiar with the Bible, as well the Old and New Testament," said the man who adds Suleiman Ahmad in front of his name after embracing Islam. Stephen's own claim, first contact with religion is when taking part in the Catholic church. While it was not yet decided to join the teaching, he was interested in some literature about mysticism in Catholicism. His curiosity made him perform a number of studies and extensive research into the country until the Spanish matador. At the beginning of his research, Stephen observes that behind the triumph of Spanish Catholicism there was a strong influence of Islamic history when in power in Spain. He admitted that he was amazed and inspired by the Islamic religion which still survive in some traditions there. "As a writer, I was researching this phenomenon for years. At first I learned that history through a variety of ancient literary works that show the influence of Islam in the Iberian region," he said. Early 1979, he began studying Kabbalah, a mystical Jewish tradition. "Well, pull in the Kabbalah that I found also the influence of Islam," said Stephen, who studied the Kabbalah for nearly 20 years. During the studied Kabbalah, he had traveled to Bosnia in his capacity as a reporter. "In 1990 for the first time I've come into contact directly with the Bosnian Muslims and for the first time anyway, I visited a mosque in the capital Sarajevo," he said. "Slowly, I saw that Islam could offer a way" closest "to get the love of God," said the man who is also actively follow orders Naqshabandiah time in Bosnia. He met with Sheikh Hisham, a teacher Naqshabandi congregation there. Her heart was really impressed until in a matter of weeks he too bersyahadah in the Balkan country's. "I'm proud to be Muslims," ​​I am he. In Sarajevo, Stephen found a lot of things that impress her. "I found an outpost of Islam in Europe, during which I did not feel as a foreigner there. Now where I was so easily able to meet and mingle directly with the people of Islam are so friendly, so too among the educated. I found the poem and musical composition so beautiful, expressing the values ​​of dignity and peace in Islam, "said he was filled with admiration. "I've found an" old park "beautiful," Stephen said quoting one of the temple of the most famous Bosnian song that tells about the heyday of the Ottoman Caliphate in the Balkans and its contribution to Islamic culture. Stephen also read some parts of the Koran and visited Islamic monuments in the Balkans during his visit. "I like back to the garden and finally into it," said he gives is like. Yes, he finally did decide to convert to Islam when in Bosnia. Since accepting Islam, Stephen is very careful in sending information Islam, be it to family, friends to the nearby neighbors. "I do not want to carelessly give this info, fear of conflict and controversy will arise .. I do not want this experience is seen or labeled as something stupid or petty. This is not about me personally, but it relates to God. I want this process of Islamic are in a reasonable way. It is solely for the good of Muslims and also for the establishment of relations within the bonds of Islamic brotherhood la ilaha illallah, "he said. "I observe, sometimes non-Muslims see as a new convert to Islam who are affected by life in the Balkans. But I soon straighten this opinion claiming that Islam is not because I like to engage the political or humanitarian reasons, but solely because of pure wonderful message brought by Prophet Muhammad as a messenger of God, "he said again. "As I mentioned at the beginning, I found that the positive things in Jewish and Christian religions of the Book. These values ​​were positively reflected in the teachings of Islam. So, Islam came refine previous religion," said Stephen. "I'm very confident, without any tolerance Arabs Spanish first, especially when the Ottoman Caliphate still prevail, then the Jews have long gone from this earth's surface. As Judaism today, it is very much different from teaching them while still coexist with the Muslims first, "said Stephen. "After embracing Islam, the thing that really impressed me is the peace of mind with the presence of God in every thing. Appear feeling soft, polite, modest and sincere feeling. My life is so easy. Even when I have a problem or exams in this life, "said Stephen, who is very sure if the values ​​of Islam will be able to solve various problems in America, especially the matter of moral crisis. Sort of. 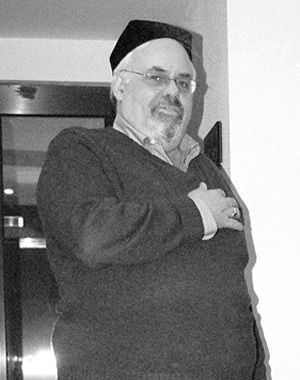 Stephen Schwartz is currently believed to be the Executive Director of the Center for Islamic Pluralism, founded on March 25, 2005 and based in Washington DC. He is also author of best-selling book The Two Faces of Islam: Saudi Fundamentalism and Its Role In Terrorism. The book has been translated into several languages. In the book he expressed his disapproval with the stamp of Islam not a terrorist and openly criticized the Bush administration is always identify with Arab terrorists. Due to the sharp criticism that Stephen was then sacked from his position as a news writer at the Voice of America's prestigious media. Likewise, in some instances, when Stephen was deeply saddened to see the conflict in the Middle East. "I often dream of peace and friendship between Israel and the Arabs. Sepertimana Just when Jews could live peacefully in the leadership of the Muslims," ​​said the young man who dikala been involved in radical leftist groups. I respect u as a muslim. Surely, western countries understood islam by calm and peace nature.